Spike Bar Jungle (or World Star -8) is the eighth level of World Star in Super Mario Run. It can only be played after the player completes Lakitu's Revenge while collecting at least three hundred coins. The level begins with a Pause Block, along with a Spike Bar and a Goombrat. The player must jump from two more Pause Blocks to reach the first Pink Coin. 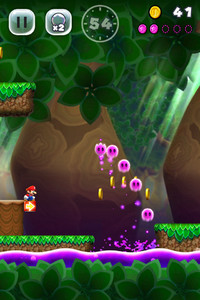 After jumping from two additional Pause Blocks and evading a River Piranha Plant, the player must jump across some more Goombrats and use the Long Jump Blocks at the end to obtain the second Pink Coin. The player must then pass some Poison Bubbles and wait on a Pause Block to get across a triple-Spike Bar and collect the third Pink Coin. After passing another River Piranha Plant, the player must avoid a trampoline and climb a sticky wall to make their way to the fourth Pink Coin. Afterwards, the player must hit a Red Ring and collect all of the Red Coins to obtain a Super Star and easily collect the fifth and final Pink Coin from the first set of rotating coins. After passing through many rotating coins, the player will reach the Goal Pole. The level begins with a Pause Block, along with a Spike Bar and a Goombrat. The player must jump from three more Pause Blocks to reach the first Purple Coin. After jumping from one additional Pause Block and evading a River Piranha Plant, the player must carefully wall jump at the next Pause Block and use the Long Jump Blocks at the end to obtain the second Purple Coin. The player must then pass some Poison Bubbles and wait on a Pause Block to get across a quadruple-Spike Bar and jump to collect the third Purple Coin. After passing another River Piranha Plant, the player must jump on a trampoline and carefully wall jump to reach the fourth Purple Coin. Afterwards, the player must hit a Red Ring and collect all of the Red Coins to obtain a Super Star and easily collect the fifth and final Purple Coin from the third set of rotating coins. After passing through many rotating coins, the player will reach the Goal Pole. The level begins with a Pause Block, along with a Spike Bar and a Goombrat. The player must jump from five more Pause Blocks and evade a River Piranha Plant to reach the first Black Coin. Afterwards, the player must carefully wall jump at the next Pause Block, use the Long Jump Blocks at the end, then wall jump again to obtain the second Black Coin. The player must then pass some Poison Bubbles and wait on a Pause Block to get across a sextuple-Spike Bar and jump to collect the third Black Coin. After passing another River Piranha Plant, the player must jump on a trampoline and jump across the Spike Bars to reach the fourth Black Coin. Afterwards, the player must hit a Red Ring and collect all of the Red Coins to obtain a Super Star and easily collect the fifth and final Black Coin from the sixth set of rotating coins. After passing through many rotating coins, the player will reach the Goal Pole. Kiken! Togetoge Bā! Danger! Spike Bars! This page was last edited on March 8, 2019, at 22:12.